Cold-tolerant bacteria, also known as psychrotrophic bacteria, are notorious contaminants of milk in the refrigerated dairy food chain. These organisms, especially the pseudomonads, may produce heat-resistant enzymes that are responsible for the breakdown of proteins and lipids in milk and dairy products. Such reactions result in a variety of defects in the raw or unprocessed milk that may affect the suitability of such milk for further processing. The enzymes produced may cause defects in long-life dairy products such as cheese, butter and long-life milk. In the present study, a range of 18 yellow pigmented psychrotrophic bacteria, collectively known as flavobacteria, were isolated from local dairy products. One aim of this study was to identify these bacteria to species level using molecular techniques. A second aim was to determine the spoilage potential of these organisms based on profiles generated by the BIOLOG system (that may relate to hydrolytic enzymes produced). 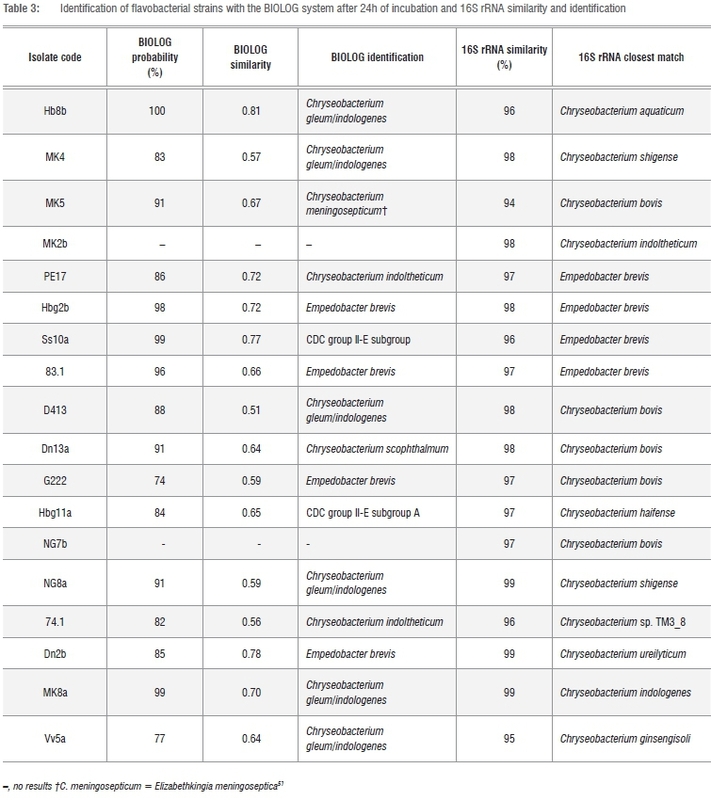 Of the 18 isolates, 14 belonged to the genus Chryseobacterium while 4 were identified as Empedobacter isolates. The most active spoilage organisms in this group were shown to be C. bovis, C. shigense and E. brevis. These findings illustrate that enzymatically catalysed defects in dairy products should not be attributed solely to acknowledged psychrotrophic bacteria such as the pseudomonads, but that flavobacterial species may also be actively involved. 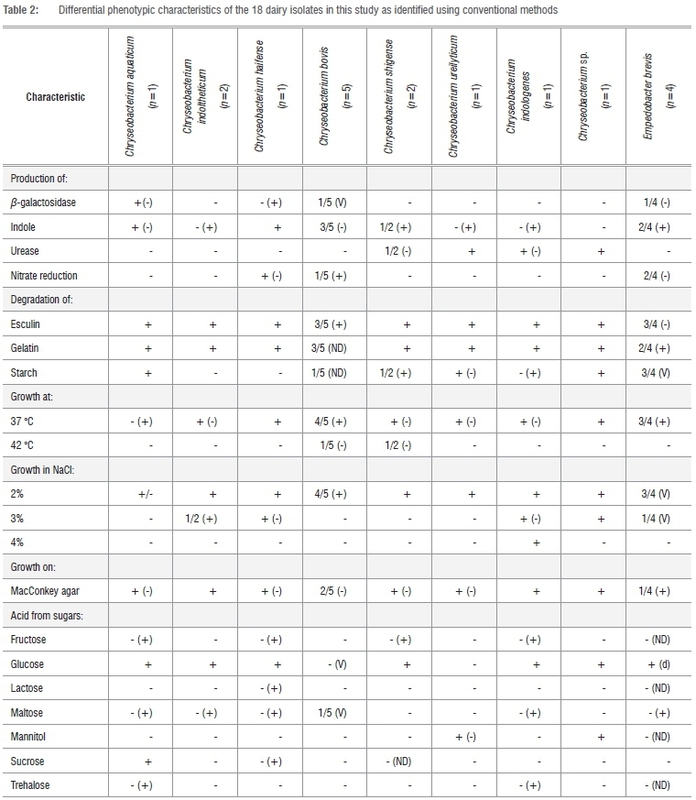 The genera Pseudomonas, Aeromonas, Serratia, Acinetobacter, Alcaligenes, Achromobacter, Enterobacter and Flavobacterium, with the predominance of Pseudomonas as the most frequent representative of Gram-negative psychrotrophic bacteria, have been isolated from raw milk.5 Yellow pigmented psychrotrophs included in the bacterial family Flavobacteriaceae have the potential to decompose milk and dairy products.6 These flavobacteria produce proteolytic enzymes that may survive pasteurisation7-9 and cause bitter flavours, gelation of long-life heat treated milk10 and the production of off-odours.11-13 Jooste and Britz8 found that the practical importance of dairy flavobacteria lies as much in their psychrotrophic growth and consequent proteinase production in refrigerated milk as in their contamination of milk via poorly sanitised pipelines and equipment. Because of the latter changes in the flavobacterial taxonomy, it was decided to re-evaluate flavobacterial isolates from a previous study.14 The aims of the study were therefore to more adequately identify flavobacterial strains isolated from dairy sources by 16S rRNA sequencing and phenotypic characterisation and then to estimate or predict the potential spoilage characteristics of the isolates by utilisation of the considerable range of substrates in the BIOLOG system. The 18 isolates used in this study were isolated in a previous study, from raw cow's milk and butter samples from diverse regions of South Africa.14 (Table 1). The isolates were preserved in the freeze-dried state and maintained at -20 °C. These freeze-dried cultures were revived by inoculation into nutrient broth (NB; Oxoid CM67, Thermoscientific, Basingstoke, United Kingdom) and incubated for 48 h at 25 °C. This was followed by streaking onto nutrient agar (NA; Oxoid CM003; Thermoscientific) and incubation for 48 h at 25 °C. Gram staining, oxidase and catalase tests20 were performed on pure cultures to verify that the isolates were Gram-negative and oxidase and catalase positive, before further analysis. The DNA of the 18 isolates was extracted as previously described.21 Polymerase chain reaction (PCR) amplification of the 16S rRNA gene was performed using an Eppendorf Mastercycler Temperature Gradient Personal Thermal cycler (Applied Biosystems, Johannesburg, South Africa) and the forward, 27F (5'-GAGTTTGATCCTGGCTCAG-3') and reverse, 1492R (5'-GGTTACCTTGTTACGACTT-3') primers.22 The PCR product was visualised on a 1% (w/v) agarose gel. The 1.5 kb bands obtained were excised from the agarose gel and purified using the DNA clean and concentrator kit according to the manufacturer's protocol (Zymo Research, Irvine, CA, USA). Sequencing was performed using both the forward and reverse primers with an ABI BigDye® Terminator v1.1 sequence cycler (Applied Biosystems, Johannesburg, South Africa) according to the manufacturer's instructions. The newly determined 16S rRNA sequences (ca. 1500 bp) were compared to those available on the NCBI GenBank database23 using the Basic Local Alignment Search Tool (BLAST). A phylogenetic tree was constructed using the neighbour-joining method in the MEGA 4 software24 to determine the relationship of isolates in this study with those on the NCBI GenBank database. In order to support the data obtained from the 16S rRNA sequencing, a range of phenotypic tests19,20,25 were conducted using 24 h-old cultures on Na at 25 °C. The tests included pigment production, motility (flagellar type), growth in 0-5% (w/v) sodium chloride, growth at 5 °C, 25 °C, 37 °C and 42 °C; growth on β-hydroxybutyrate agar and MacConkey agar (Oxoid CM115, Thermoscientific); production of catalase, oxidase, phosphatase, DNase, urease, indole (Kovacs reagent, Merck 1.09293), β-galactosidase (ONPG) and reduction of nitrate; hydrolysis of esculin, gelatine (tube method) and starch; and acid production from carbohydrates in ammonium salts medium containing the following sugars: arabinose, cellobiose, D-fructose, D-glucose, lactose, maltose, mannitol, rhamnose, sorbitol, sucrose, trehalose, and D-xylose. For the estimation and prediction of potential spoilage characteristics, the isolates were streaked out and incubated at 25 °C for 24 h. The isolates were inoculated onto BIOLOG GN2 microplates (BIOLOG Inc., Hayward, California) according to the manufacturer's protocol. The 96-welled microplates contain 96 different oxidisable carbon sources which could be grouped into carbohydrates, amino acids, carboxylic acids and polymers and which were used for the estimation of the potential spoilage characteristics. The results of the 16S rRNA sequencing indicated that 14 of the 18 dairy isolates belonged to the Chryseobacterium genus with sequence similarities between 94% and 99%, while four isolates belonged to the Empedobacter genus with sequence similarities between 96% and 98%. 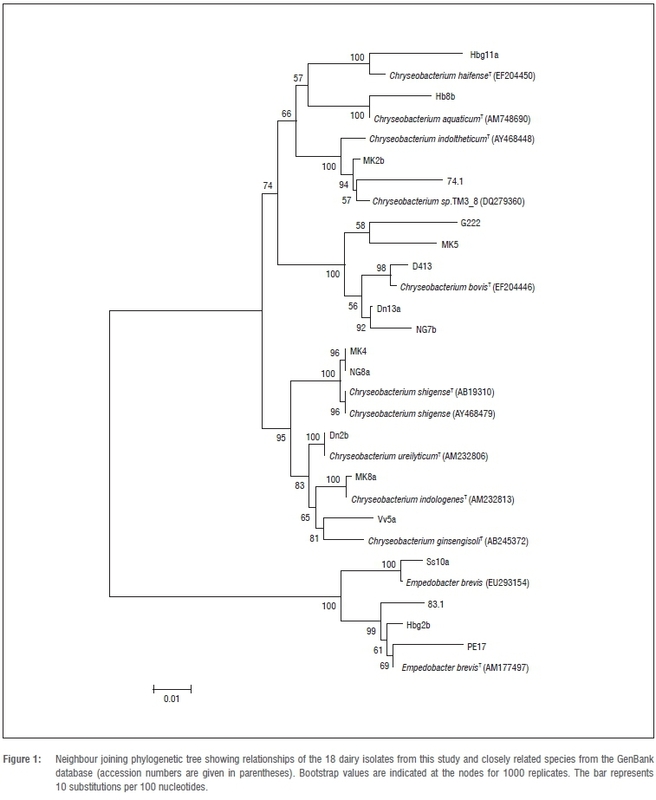 The phylogenetic relationships of the isolates to the type strains of Chryseobacterium species and Empedobacter brevis are shown in Figure 1. Although isolate Vv5a grouped closely with C. ginsengisoli, it could not be assigned to this species because of the low bootstrap value of 81 (Figure 1) when compared to the type strain. These data may suggest that isolate Vv5a could represent a new species. Isolates Ss10a, 83.1, Hbg2b and PE17 were identified as Empedobacter brevis. Phenotypic analyses supported the 16S rRNA sequencing results by demonstrating typical phenotypic characteristics of the genera Chryseobacterium and Empedobacter.21 All isolates were strictly aerobic, Gram-negative rods with yellow flexirubin or carotenoid pigments. All isolates were positive for the production of catalase, oxidase, phosphatase, DNase; growth at 25 °C and growth in 0 and 1% NaCl. All the isolates were negative for motility; growth in 5% NaCl and acid production from arabinose, cellobiose, rhamnose, sorbitol and xylose. The differential characteristics of the genera and species identified in this study are shown in Table 2. Although the BIOLOG method can also be used for identification purposes, the only flavobacteria that formed part of the BIOLOG database were C. gleum/indologenes, C. meningosepticum, C. indoltheticum, C. scophthalmum, E. brevis and CDC group II-E. The BIOLOG method could therefore only confirm that the isolates belonged to the Flavo-bacteriaceae family with grouping in either the Chryseobacterium or the Empedobacter genera (Table 3). Interestingly, Chryseobacterium strain Vv5a did not utilise any of the carbohydrates tested in this study. This was in accordance with the 16S rRNA sequencing results, which showed that isolate Vv5a did not cluster with any of the type strains tested. These results lend impetus to placing the strain in a new species. 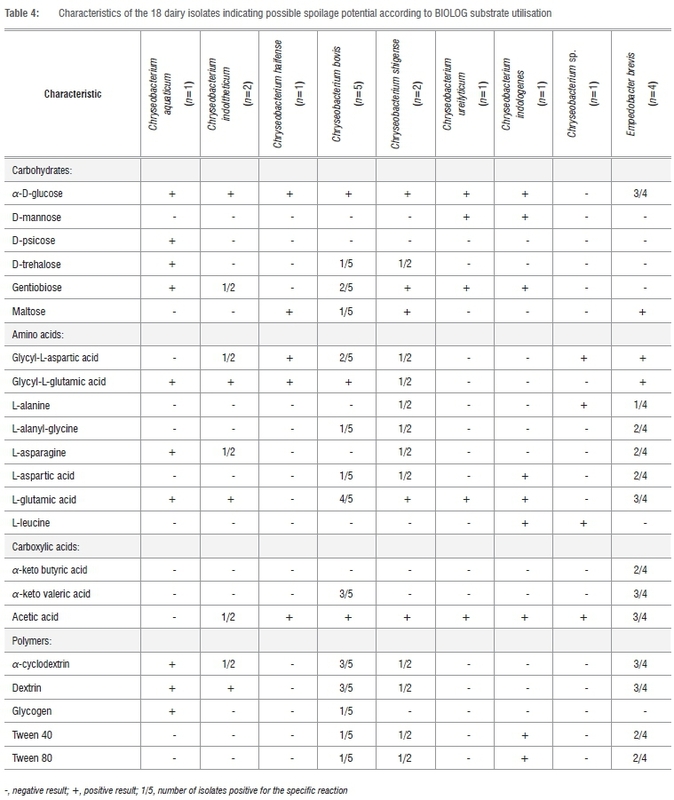 All the Chryseobacterium species (except strain Vv5a) and E. brevis isolates tested in this study were able to utilise glycyl-L-glutamic acid and/or L-glutamic acid (Table 4). The second most utilised amino acid was glycyl-L-aspartic acid. The oxidation/reduction of glutamic acid may yield acetic acid, butyric acid, carbon dioxide, ammonia and hydrogen. While the catabolism of amino acids is not a direct indication of hydrolytic breakdown of peptides or proteins, it is known that the flavobacteria are often psychrotrophic and proteolytic.7-9 The majority of psychrotrophic bacteria have the ability to form hydrolytic, thermostable enzymes that break down the major constituents of milk, such as the protein.2 The action of such enzymes destabilises the casein in milk through hydrolysis, and the result is the formation of a gel structure or coagulation of sterilised milk during storage.2 The problem of the destabilisation of milk proteins leading to the precipitation or 'flocculation' of milk proteins during heat processing of milk has been identified as an important problem by the National Milkproducer's Research Workgroup of MilkSA.43 Proteolytic enzymes of psychrotrophic bacteria have been cited as a possible contributing factor to this problem in certain milk producing regions of South Africa. When comparing the utilisation of the 22 substrates by the isolates tested in this study, C. bovis, C. shigense and E. brevis had the ability to utilise 16 of the 22 substrates, which could indicate that these species have the potential to cause more pronounced types of spoilage than the other species tested. The frequency of utilisation of the 22 carbon sources by the remaining isolates were as follows: C. aquaticum (10/22), C. indologenes (9/22), C. indoltheticum (9/22), C. haifense (5/22), C. ureilyticum (5/22), Chryseobacterium sp. Vv5a (4/22). 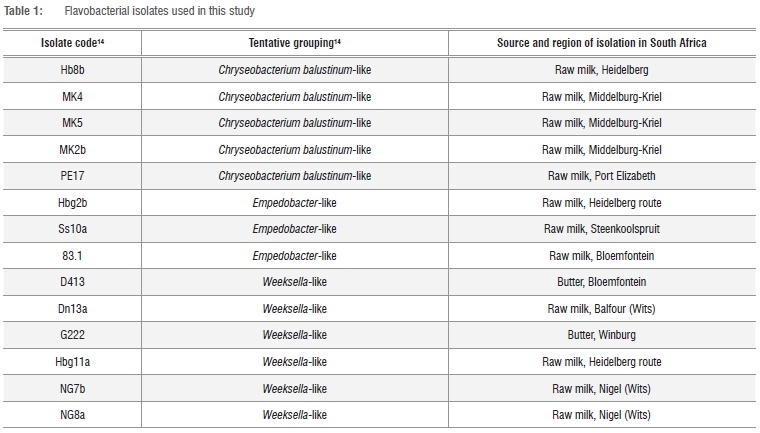 Flavobacteria previously isolated from dairy sources were shown in this study to belong to a range of Chryseobacterium species and to Empedobacter brevis by employing 16S rRNA sequencing and a variety of phenotypic tests. Although the BIOLOG system could not be used as an identification tool because of the limited database, it proved to be an excellent differentiation tool on the basis of the substrates utilised by the isolates. The BIOLOG system was also valuable in determining potential food spoilage characteristics of the isolates. The carbon sources most frequently utilised in the BIOLOG microplate system by the isolates were glucose, acetic acid, dextrin as well as amino acids such as glycyl-L-aspartic acid, glycyl-glutamic acid and L-glutamic acid. These may lead to spoilage characteristics such as off-odour production (e.g. fruity, malty, ripened-cheese, rancid, sweaty, putrid, sulphide-type), coagulation of milk, sourness and bitterness. Many of these spoilage characteristics result from the action of hydrolytic enzymes produced by the organisms. Proteolytic enzymes of psychrotrophic bacteria have been cited as a possible contributing factor to the important problem of milk 'flocculation' recently being encountered in certain milk producing regions of South Africa. The flavobacterial species are believed to have the potential to cause spoilage defects in dairy products because they were able to utilise a wide range of compounds in the BIOLOG system. In this regard C. bovis, C. shigense and E. brevis were the most active and could utilise 16 of the 22 carbon sources even though varied reactions were shown where multiple strains of the organisms were tested. This was followed by C. aquaticum (10/22), C. indoltheticum and C. indologenes (9/22). Species that were least active included C. haifense and Chryseobacterium sp. Vv5a (4/22). These findings illustrate that enzymatically catalysed defects in dairy products should not be attributed solely to acknowledged psychrotrophic bacteria such as the pseudomonads, but that flavobacterial species may also be actively involved. C.H. was the project leader and responsible for experimental and project design; L.I.T. performed the experiments; P.J.J. made conceptual contributions; G.C. contributed to the interpretation and discussion of the biological results; L.I.T., P.J., G.C. and C.J.H. wrote the manuscript. This work was supported by funding from the South African National Research Foundation. 13. Bekker A. Growth and spoilage characteristics of Chryseobacterium species in milk [MSc dissertation]. [ Links ] Bloemfontein: University of the Free State; 2011. 14. Jooste PJ. The taxonomy and significance of Flavobacterium-Cytophaga strains from dairy sources [PhD thesis]. [ Links ] Bloemfontein: University of the Orange Free State; 1985.